Burke throws his biggest fans under the bus – What's Up With Francis-Church? But don’t worry! I’m sure the Africans will save us! And sure enough, the hyenas are going for it, without delay. Faithful Catholics around the world love Cardinal Burke. And in truth, there is and has been much to love. He is a good and holy man who loves Our Lord and His Church. He has, for a very long time, been one of the few voices of doctrinal sanity in a hierarchy gone mostly off the rails. Our coverage of him in these pages has, for this reason, been universally positive. But during the Synods, I noticed an alarming thing happening. Whenever Cardinal Burke made a strong statement about Church teaching that appeared as though it could be construed as a criticism of the pope, he would quickly and urgently seek an opportunity to put such a notion to rest. This happened not just once, but several times. Here’s an example from October, 2014. Another from April, 2015. Steve, I’m sure, doesn’t want to be the one to say it, so I will: Burke has never been the great white hope everyone imagines him to be. It was mostly a case of the Catholic conservatives believing the secular press when they called him a “hardliner” and all that. We were desperate for it to be true, but I think they mostly did it because they didn’t have Ratzinger around to call nasty names anymore. The “liberal” paradigm requires a villain, no matter how ridiculous it is in real life. I am acquainted with Cardinal Burke, at least a little, and honestly folks, he’s a good guy but a company man to the core. In all the outrages of the last three years, he has done the same thing over and over. He has either remained silent (Lalalalala Laudato Si… I can’t heeeaaar yooooouuu!) And, as Steve said above, each time he has said something publicly that has been taken by the press or anyone else as critical, he has instantly dived for the phone to backpedal as fast as he could. I realize it’s a hard habit to give up, but we really, really have to stop looking for a superhero to rescue us. We hate the idea that we’re it. We’re the ones stuck with the task of calling it like it is. The only bishop I think I still have any respect for (for the moment) is Athanasius Schneider, and he came right out and said recently that the task of defending the Faith is being laid on the lay faithful. This pope makes me ill. I have many atheist friends. They love him, and they endlessly attempt to stuff him into my face declaring that I must now side with them because my Pope said so, and as Catholics have no choice but to believe what our Pope says, unthinkingly. This all sounds very good to me. He is exactly what we have needed all this time. He is forcing the remaining believing Catholics to learn and defend their Faith, and even the simple laws of rational thought, something we have not had to do in a long time. We’re it, guys. Sorry, but it’s true. We’re just going to have to get on with the task at hand as best we can. 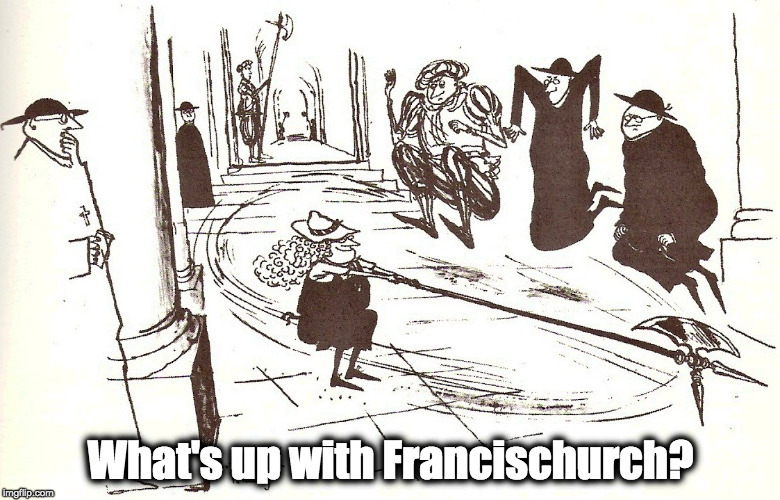 Pingback: A tale of two churches… – What's Up With Francis-Church? Trackback: A tale of two churches… – What's Up With Francis-Church? I hear you about the untold story, but will there be enough orthodox cardinals in the next conclave so that there will be a correction? I offer an alternative. Burke was the first. Could it be that his words were a kind of raising of a flag? No enemy is defeated by raising a flag, but it is a pivotal moment in a rally to attack. The Latin Mass is (ab)used as a diversionary tactic, even as an implement or tool, to turn otherwise good people into heretics over time. At first the enemies of the Church thought they had to stamp it out in the 1970’s to achieve their goal. Then they realized that you catch more flies with honey, so it was “allowed”. People who merely *prefer* the Roman Rite of Mass, rather than insist upon it in principle are sitting ducks. He should have ripped AL and dared the Pope to remove him. It would have backfired bigtime. Yeah, I’m sure he would have opposed paying taxes 40 years earlier to fight Hitler. Oh right, the Seattle elite have no problem going after Germans (WWI, WWII) but not anybody else. Seriously, Hunthausen wasn’t even on Reagan’s radar. If it was John Cardinal O’Connor of NY or Law of Boston, that’s another thing. Nobody cared about Hunthausen — except he embarrassed the Church by tying us to the Looney Left. Love it – love the film as well. Wasn’t it St Therese of Lisieux who said she almost envied those who would live in these times because she thought the greatest saints would live then? Well, we’re all He’s got so let’s follow the Sergeant and step up to the mark! I think it meant humanly speaking – Mary is coming to save us. We just have to work out our strategy in the meantime. “I have many atheist friends” – So let’s cause some scandal. I have just told my Christian Fellowship friend that if anyone starts praising the Pope, she is to tell them from me that he’s a heretic. I have a very long fuse but I call a sheep a sheep and a goat a goat and a heretic a heretic – otherwise we are simply playing the same game as so many of the clergy. You start by writing letters, then you have a ‘polite-ish’ stand-off every weekend which starts thawing till the the next letter………………. Pretty strong stuff? Hey, my native language is English – perhaps it sounds stronger in French? Let’s concentrate on the “the first sign of respect and love for them is to speak the truth to them with love.” shall we, at least till the next bomb hits us! That bit’s OK, taken by itself. Go into more detail about the battle thing. Fair points….but then what…..violate Church teachings because people’s feelings will be hurt ? Sadly, Jeanne, we have worse cases than AL involving heresy. I am sure they are there in France along with the rest of Europe. What were those bishops/cardinals who voted at Synod 1 to declare homosexual relations “positive” ? What where they thinking ? What is the Pontifical Acadamy on the Social Sciences doing putting out Laudato Si and working with the UN and abortionists ? Would the Vatican work with the Klu Klux Klan on pro-life issues ? Would it embrace anti-Semites to lure back traditionalists ? Why does the Vatican welcome every form of garbage from The Left, but spit on loyal Catholics ? How about the Pope prioritizing the Faith and the Cardinals and Bishops, too ? When you have heretical filth like some of the European bishops declaring schism and advocating positions 180-degrees opposite to the Catholic faith, what are we supposed to do ? What about the Cardinals and bishops who tolerate renagade priests and nuns ? What about garbage like Roger Mahony and Rembert Weakland ? And that was on JP2 and B16. Why weren’t they disciplined like Hunthausen ? Why weren’t all 3 given 48 hours to shape up or ship out ? Mahony has destroyed the LA Archdiocese and Weakland destroyed the entire Church in the U.S.
Jeanne, the problem is that nobody knows what this thing means. Is that good ? What do those headlines say ? Is Francis or the Vatican going to demand several hundred photographic corrections to get the record straight ? And if the record is already straight……then DRM and communion is OK, Kasper gets more $$$ from the German government and gets to upgrade to a BMW 7-series, and adultery is now OK. Speaking as an Anglican pastor who served under two forms of ‘local option’ for divorce/ remarriage cases, I assure you that what it meant in practice was torturing the pastor. I’m also thinking the bishops will download this to the local parish. Sincerely don’t believe the son or daughter of a wealthy leading parishioner should be allowed to the altar after a divorce? Have a marginal parish family who will be deeply offended & confused if you deny the local eucharist option? Want lots of pre- or retroactive fights in church councils (or in the parking lot, afterwards) over who ‘deserves’ what? Hmm: “Father X is a refuser (i.e. trad), so we need to petition the bishop to remove him, for Father Q, who is all about the mercy”. Oh yeah– living the dream. The problems are endless, and may further whittle down the already brittle spines of many clergy, who are victims as much as enforcers of the latest crazy idea coming down the pipe– or, blacken their names as radtrads if they dare question the new order of things. All these square wheels have been tried, and just because Rome is now possibly going to try such, doesn’t make the square or triangular or trapezoidal wheels magically round. Hunh? I thought you were Christian. So Cardinal Burke just told us that we don’t HAVE to commit mortal sin or to believe in it. His St. Peter denial moment, me thinks. Eventually the great schism will occur and then sides will be chosen publicly, with the heretics owning the buildings. Get to know the traditional priests now who will have to say Mass in your basement. They’ve accepted the spirit of V2. If they seem “traditional” it’s because of the bells and smells, not the doctrine. Is it possible to like this infinity times? I would have gone for “High Water (for Charley Patton)”, from Love and Theft. But this is good. Bob always has the answers, and no one changes his doctrine, yo. I agree, Barbara. Madiran’s example was to battle relentlessly – by the pen – against error and injustice , and he also was on the front lines to fight for the right to the Tridentine mass, the true Catechism and unadulterated Holy Scripture. That means accepting to be treated as an outcast, which he did. But when there was the risk of people leaving the Church, and he thought something he might say would foster that, he would prefer silence. That doesn’t mean keeping quiet when heterodoxy is being taught : but when I read cardinal Burke’s reaction, that is what I understand – when things are getting really bad hang on to the unequivocal truth as set out by the infallible magisterium, no matter what, in true fidelity to the Vicar of Christ. You tell him. Simple as that. You tell him he’s wrong. Preferably in front of adoring members of his congregation. “Father. You’re wrong”. Invisibilium within the Prelature is that cleric whose puissant possession of Tradition is such that it could be applied as a force against our Inertia Into Indifferntism. Once the biggest sports star in America came crying to ArchbishopFulton Sheen about his marriage. The arcbishop told him that his marriage was no such thing because both he and the woman were already married and to get over it and go home to his real wife. He refused but at least the archbishop called it. It sounds like Cardinal Dolan just said “Oh poor you,” all these years. I hope I read this wrong. What is gobbledy-gook about this? It’s pretty straight forward to me. He begins with a situation then qualifies it; squares it off. Oh, thank heaven! I’m at least familiar with this. With respect, Jeanne, you say Jean Madrian taught you “resistance is necessary.” How to resist? Good priests are teaching the faithful Truth. Bad priests are teaching heterodoxy. How does the flock of a bad priest resist? Specifically, how do they resist? I’ve seen this so many times – “criticism of OK, that resistance is necessary, but…” Please give me some concrete examples of how this resistance is to be done. Empty, soothing words are not armour, or a battle plan. Let us be ever hopeful There will be much silent dissent and resistance from the Bishops and the clergy, I believe. Their wilful lack of actions in promoting the words of this reprobate pope may be hard to notice, as it should be, but it will be there. Sometimes stealth is the best approach. Silence can speak louder than words as we all know. Listen for the sounds you don’t hear. Was Jesus “reasonable?” We’re killing ourselves with an addiction to the Church instead of the Truth, now that the two are a fork in the road. It is unreasonable to think that Cardinal Burke, or any other “establishment prelate,” for lack of a better term, is going to publicly oppose/denounce the pope when the majority of prelates are praising this most recent document, not to mention all the media types, “gays,” Jesuits, and others who are praising it. That’s just not a reasonable proposition. Of course, Our Lord and Our Lady are with us, along with the angels and saints, but humanly speaking, we are quite alone. Just before I clicked to this article, I said the exact same thing to DH. Then I included another, like-thinking family. Truly, I can count on maybe ONE hand the folks who are up to the task. You’re right, Hilary, we’re IT! God help us!